Josh presented to the clinic post brain tumor problems, his speech was fragmented and he was in severe pain, which restricted his ability to do his rehabilitation exercises . After 12 session he speaks sentences and is pain free, he is trying to walk more now as well. At Move Well we are so proud of his results and continue to work with him. I have suffered from fibromyalgia for about 30 years. After just two sessions in the hyperbaric oxygen therapy, I started noticing a reduction in fatigue. Then, after about 4 sessions the benefits were quite dramatic, with a significant “lightening” of the “heavy body” fatigue. I found it easier to move and didn’t tire as quickly. I wondered to myself, “is this what it is like to feel normal?”. This would last for about a day or so after the session. But after just a few more sessions, about 8 in total, I noticed that my symptoms were not returning as severely in between the sessions either. There is a definite improvement, particularly in reducing that debilitating heavy body fatigue. I can do so much more, live more. Just thought I would let you know how I went at Mooloolaba tri. Your a legend. Couldn’t have done it without your help. Thank you! On to the 1/2 Ironman at the end of August. So very thankful that Matt was able to recommend the Hyperbaric Oxygen Therapy to help heal a massive black eye after a very silly fall. 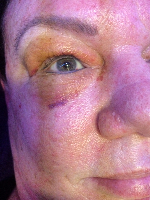 I was not able to open my eye for 24 hrs, and saw Matt soon after for a regular musculoskeletal appointment. He explained the function of the Hyperbaric Oxygen Therapy and I had my first treatment 7 days after the fall. There was immediate reduction in swelling and discomfort, and this continued improving for a further 24 hrs. 2 more visits during the following week returned my eye to normal vision and feeling. What a relief to be back to normal so quickly after such a stupid accident. The added bonus of the treatments was an improvement in clarity of vision (I am long sighted and wear glasses at a computer all day), I also felt an improvement in lung capacity and body circulation (I work in an air conditioned office). Thanks again Matt for explaining the benefits of this treatment, and for the treatment being so beneficial in getting me back to my normal routine in a couple of weeks, not months. Cannot recommend this treatment highly enough, so many benefits . 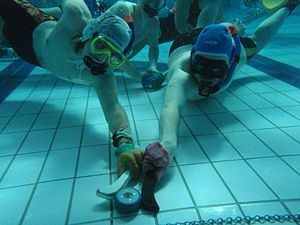 I play both Underwater Hockey & Underwater Rugby which requires a curtain level of breath holding ability, fitness & rapid recovery on the surface. I’ve noticed that with my Oxygen Hyperbaric Therapy sessions leading into tournaments, it has improved my ability to recover faster on the surface & subsequently hold my breath longer during games. I’m impressed & I’m currently doing another round of Hyperbaric Sessions leading into my next tournament.